Past winners of The Bowerman dazzled under the bright lights of the 2018 USATF Indoor Championships this past weekend in Albuquerque, New Mexico. 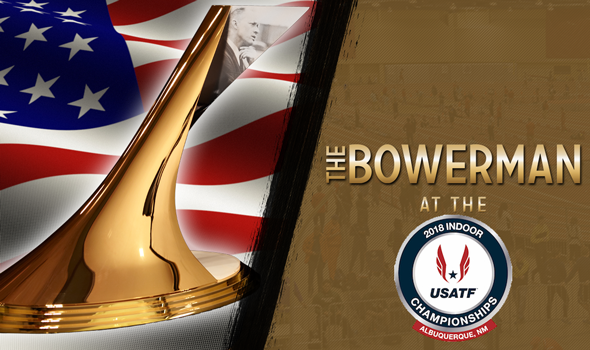 Five of the past six winners of The Bowerman – collegiate track & field’s highest honor – made Team USA, including both recipients in 2016 (Jarrion Lawson and Courtney Okolo) and 2017 (Christian Coleman and Raevyn Rogers). Marquis Dendy, the men’s winner of The Bowerman in 2015, fills out that list. No one starred more than Coleman, who broke the world record in the 60 yesterday. Coleman ripped down the track in 6.34 and smashed Maurice Greene’s former standard by .05 seconds – the largest record-breaking margin in event history. That was actually the second time in the past month that Coleman went under the former world record. Coleman clocked a time of 6.37 in January at the Clemson Invitational, but it wasn’t ratified by the IAAF. Lawson and Dendy – as well as Jarvis Gotch and Michael Hatfield – put on a show in the long jump. All four of those men soared 8.14m (26-8½) or farther, which was the first time in the history of the meet that has happened. Lawson and Dendy – the 2016 indoor world champion – went 1-2 with marks of 8.38m (27-6) and 8.22m (26-11¾), respectively. Okolo knew she had to go sub-51.19 to make Team USA and did exactly that. The former Texas standout crossed the finish line in a world-leading time of 51.16 with former Miami (Fla.) star Shakima Wimbley hot on her heels (51.17). Rogers impressed at every turn in the Land of Enchantment. She set the tone early with a personal best of 1:59.99 in the first round and gave Ajee’ Wilson quite the race in the final. Rogers eventually finished runner-up in 2:01.74 and secured a trip to the United Kingdom. Other past winners fought for bids to the 2018 IAAF World Indoor Championships as well, including 2010 women’s recipient Queen Harrison (fifth, 6o hurdles) and 2011 women’s recipient Jessica Beard (ninth, 400). Coleman, Dendy, Lawson, Okolo and Rogers will look to add to the already growing medal collection for past winners of The Bowerman at the IAAF World Indoor Championships. All told, past winners have captured eight medals, which include five golds. The 2018 IAAF World Indoor Championships will be held March 1-4 in Birmingham, Great Britain and Northern Ireland.